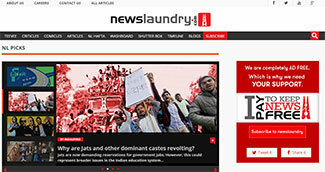 News Laundry Media Pvt Ltd, which runs media portal Newslaundry, has raised funding from Omidyar Network and a bunch of angel investors, it said on Monday without disclosing the amount. Eicher Motors' former chairman Vikram Lal, serial entrepreneur Abhijit Bhandari, Seedfund co-founder Mahesh Murthy, and Shashank Bhagat, through United India Periodical Pvt Ltd where he is partner and director, also participated in the round. Newslaundry had last year raised Rs 18 lakh from Bhandari, according to VCCEdge, the data-research platform of VCCircle. It has now raised Rs 3.8 crore, of which Omidyar invested Rs 3.1 crore. 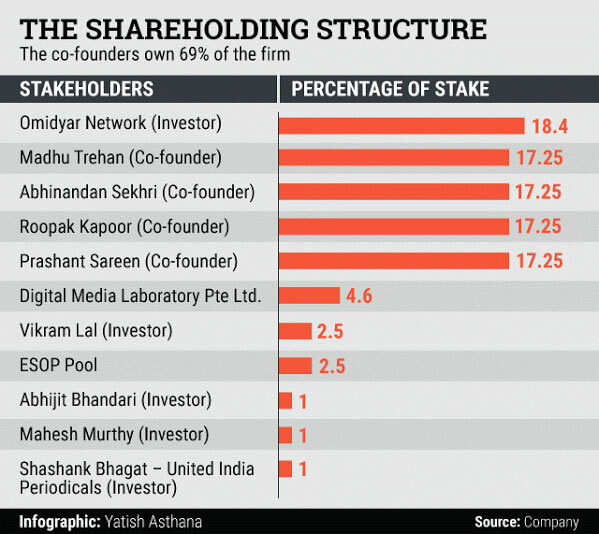 Omidyar now holds an 18.4 per cent stake in the company. The latest transaction values the firm at a little over Rs 17 crore, as per Techcircle.in estimates. Murthy and Bhagat have invested Rs 17.1 lakh each while Lal has put in Rs 42.8 lakh, the company's filings with the Registrar of Companies show. A spokesperson for Newslaundry said in an email that although Bhandari invested last year, his investment has been formally disclosed now. The portal was launched by journalists Madhu Trehan, Roopak Kapoor, Prashant Sareen, and Abhinandan Sekhri in 2011. The four co-founders now own a stake of 17.25 per cent each in the startup. "You will see us attempt some new systems where our subscribers power our growth and determine the direction in which Newslaundry goes.....What we're trying to achieve here at Newslaundry is a sustainable and efficient economic model for independent and fearless news. What we would like to do is help evolve what the model for news will be in the digital age," co-founder Sekhri said in a post on the Newslaundry website. Alternative news portals have received a lot of investor interest lately. Inshorts, previously known as News in Shorts, raised $20 million (Rs 127 crore) in a Series B round funding from existing investor Tiger Global Management last year. TheNewsMinute.com, run by Spunklane Media Pvt. Ltd, has raised an angel round from Raghav Bahl and Ritu Kapur-led Quintillion Media, publishers of TheQuint.com, a digital content platform. It was started in 2014 by journalists Chitra Subramaniam, Dhanya Rajendran and Vignesh Vellore. Quintillion has also put Rs 4 crore ($600,000) in New Delhi-based YKA Media Pvt Ltd, which owns online news and views platform Youth Ki Awaaz. This article has been modified to correct some factual inaccuracies and to include additional information on the transaction.